When April 15 rolls around every year, we celebrate the day that Jackie Robinson debuted at first base with the Brooklyn Dodgers in 1947. It’s a day for everybody to wear 42 and remember the courage of a genuine American hero. For Yankee fans, Robinson’s arrival also marked the beginning of an incredible run that saw the Dodgers and Yankees face off in the World Series in six of the 10 seasons that made up Robinson’s career. 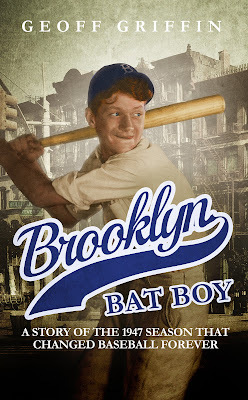 In doing background research for my book Brooklyn Bat Boy (BrooklynBatBoy.com), the fictional story of the 12-year-old bat boy for Robinson’s 1947 Dodgers, I was reminded that Robinson’s was one of the central catalysts in making Yankees-Dodgers one of the great rivalries in sports. Baseball had held the World Series 42 times - there’s that number again - before 1947, but there had only been matchup between Brooklyn and the Bronx, which came in 1941. That all changed when Robinson changed baseball forever. I don’t have to tell people checking out a Yankees Web site that New York won five of the six series, but it’s also worth noting that four of the series went seven thrilling games. Robinson established himself as a presence in the rivalry in the 1947 Series, the first ever broadcast on television. In Game 1 he drew two walks and scored a run and went on to finish the series with seven hits, two doubles and two stolen bases. The Yanks eventually won the championship in seven games. In 1949, Robinson hit .342 and won the NL MVP, but New York dominated 4-1 in the 1949 Series. Robinson did double to knock in the only run in a 1-0 win by Brooklyn. Robinson socked his first World Series homer in Game 1 of the 1952 Series, but the Yankees once again prevailed in seven. The 1953 Series was Robinson’s best in terms of hitting. His batting average of .320 was his highest in the post-season, but it was Yanks again in six. The Dodgers finally brought their one and only title back to Brooklyn in 1955. The Series will also always be remembered for a 36-year-old Robinson performing his signature move - stealing home - off of Whitey Ford in Game 1. Of course, anybody who’s seen film of it can see that the late, great, very much missed Yogi Berra very much disagreed with the call. The 1957 Series marked the final games of Robinson’s career. He played all seven games and between a double, homer and five walks, tallied a .379 OBP and .796 OPS. After Don Larsen’s perfect game gave the Yanks a 3-2 lead, the Dodgers evened things up in Game 6 when Robinson’s 10th-inning walk-off single gave Brooklyn a 1-0 win. Of course, as every good Yankee fan knows, Berra homered twice in Game 7 to give the Yankees their 17th championship. The 1957 World Series also offered an unfortunate series of lasts. It would end up being Robinson’s last game. It was the last time a New York team would be the National League representative in the World Series until the Miracle Mets of 1969. It was the last Subway Series until 2000. Whatever side you take in the Brooklyn-Bronx rivalry, yet one more accolade in Jackie Robinson’s remarkable life and career is that he helped turn Yankees vs. Dodgers into one of the great rivalries in sports. Geoff Griffin has worked as a lawyer, special education teacher, journalist and editor. He has over 20 years of experience writing for a variety of newspapers and magazines. He has had a number of essays published in anthologies and is co-host of the award-winning Travel Brigade Radio Show and Podcast. Brooklyn Bat Boy is Griffin’s first work of fiction.